Tuberculosis has been a health concern for several thousand years, and millions continue to be afflicted with this disease. 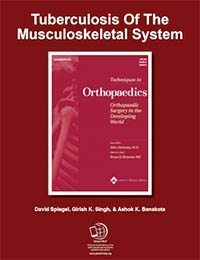 Although the disease may be found on all continents, orthopaedic surgeons working in South and Southeast Asia are most likely to encounter cases of osteoarticular tuberculosis. Tuberculosis is most common in areas with crowding, poor sanitation, and malnutrition. An increase in tubercular infection has been associated with the prevalence of the acquired autoimmune deficiency syndrome as well. While most cases are seen during the first three decades of life, the elderly population is also susceptible. Only a small number of patients with tuberculosis will have osteoarticular involvement, half of which will have spinal disease. Although chemotherapy is highly effective, the most important variable predicting outcome is the stage of disease at presentation. Surgery is reserved for specific indications, most often to establish the diagnosis or to treat complications of the disease process. In addition, efforts should be made to improve the patient’s general physiologic state. Our goal is to review the pathophysiology, clinical findings, diagnosis, and treatment options for osteoarticular tuberculosis.